With a little nudging from my parents (in form of some colorful Australian Dollar notes as a Christmas present – one of the best presents ever!) I had decided to book one of the incredibly cheap flights from Oahu to Sydney, so I flew into Sydney right in time for the Hurley Australian Open of Surfing in Manly and watched some of the big guns like Mick Fanning, Carissa Moore, Stephanie Gilmore and Kolohe Andino kick off the new season with a loud bang! I had some faint memories of Manly from my time in Australia six years ago, and really liked the idea of spending some time in that little beach town. So after quite a long trip from Waikiki, Oahu, USA, all the way to Manly, Sydney, AUS, that included pretty much every kind of transportation you can imagine (1 hr shuttle bus, 10 hrs airplane, 20 min train, 20 min ferry) I was quite tired but absolutely excited to be back in Down Under! And even though the hostel in Manly was probably one of the worst hostels I’ve ever stayed in when it comes to standards of cleanliness and security, I still had a great time in Manly – mainly because the hostel was located pretty much right at the beach (a 2 minute walk) AND because I had bought my first ever real surfboard there on my first day! I was absolutely stoked and took it out into the water right away. And even though the conditions were not perfect and the board is definitely a challenge for me in regard to its dimensions, I still had a few successful take-offs and enjoyed simply being in the water again! The Hurley Open is a massive setup along the northern part of Manly Beach as it does not only include the surf competition, but also a huge, massive skating bowl right on the beach. It was great to see some of the world’s best battle it out with the young guns who fight for their spot on the world championship tour. As the competition was on a very tight schedule, there was no time for lay days, so some of the heats were run in pretty small waves and some people were complaining about the bad conditions. However, seeing what maneuvers some of those pro-surfers were doing in knee-high waves, it just confirmed the old saying: “There’s no such thing as bad waves – only bad surfers.” So I tried to do my best once the swell picked up, but when people from my hostel returned more with broken boards than with intact ones, I decided I’d rather not take my chances and stay out of the messy water for a couple of days… Instead I enjoyed watching the comp and tried to win a Hurley wetsuit by taking funny pictures with a girl from the hostel. And even though we were really lucky and ran into Hurley-sponsored world champ Carissa Moore while doing so, we were not lucky enough to be picked with that pic of her to win the wetsuit. Which meant I went into every surf shop on the Corso, Manly’s main street, (and there’s quite a few of them) and tried every springsuit model they offered. I ended up best liking a Billabong, which I then was really lucky to find in an online shop with a pickup store in Bondi Junction for about 1/3 cheaper than the regular price! Time flew by watching the competition and surfing myself, so soon enough it was time to pack up my bags and my board and start traveling again. I stopped for one night in the centre of Sydney before heading north and I fell in love with the city again! The view from the ferry from Manly to Sydney was already teasing, but once I walked through the Royal Botanical Garden and was in the middle of it all, there was no more helping it – I almost started crying when it hit me full force again – I simply love Sydney. I wasn’t expecting it, after all these years, but the truth is: I simply love Sydney, with its Opera House, Harbour Bridge, Royal Botanical Garden, the quay, skyscrapers and all these people from all continents bustling through the streets. To me it’s an amazing city with a unique vibe, surrounded by beautiful beaches that invite you to surf. Thinking about it all, I honestly wonder how one cannot love this multicultural, vibrant, place?! It’s got a lot of cafes and bars, which I was lucky enough to be shown to by a friend I met in San Francisco and who lives in Sydney. These areas reminded me a lot of Berlin or Hamburg, only that the weather is a lot warmer and sunnier. 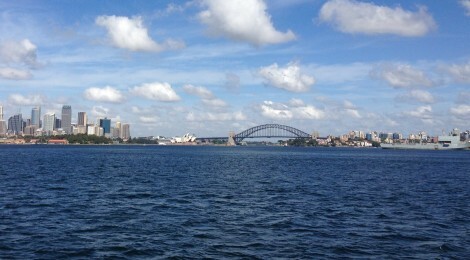 All in all, I can’t find anything bad to say about Sydney (except maybe that public transport is quite expensive). But as I had already booked my hostel on the Gold Coast, it was time to hop on the Greyhound bus and move up the coast to the next stop on my unstuck-tour: Newcastle.